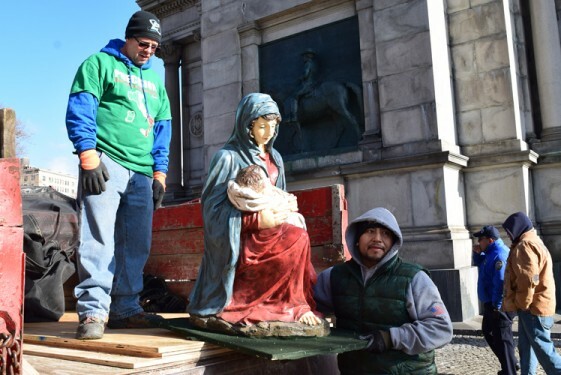 For the second year in a row, the diocese has brought the Christmas message to Grand Army Plaza. 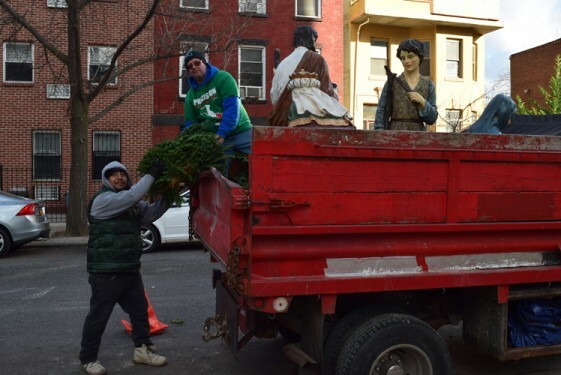 DeSales Media Group, the communication arm of the Diocese of Brooklyn and parent company of The Tablet, has arranged for a 25-foot Christmas tree and life-size Nativity scene to rest below the Soldiers’ and Sailors’ Arc. Bishop Nicholas DiMarzio will bless the crèche during an interfaith ceremony on Dec. 20 at 5:30 p.m. 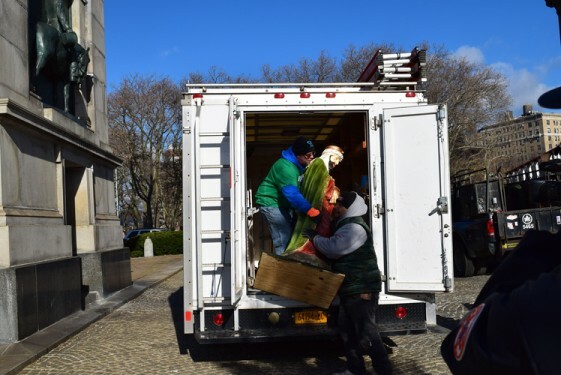 The initiative started three years ago when Father Michael Perry, pastor of Our Lady of Refuge, Flatbush, noticed that the Christmas tree that once adorned Grand Army Plaza was replaced with cones of lights. He thought it sad that another city landmark was getting farther from the true Christmas message, so he decided to investigate. 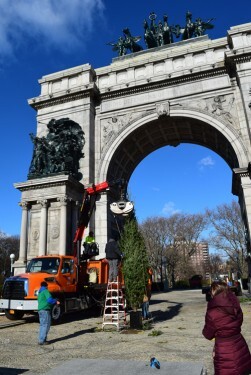 When he called the Prospect Park Alliance to inquire about the reasons for the change, Father Perry was told that the tree was provided by the park in the past and it was now simply beyond budget. A representative from the alliance also added that if Father Perry could find the money for it, the tree could go back up. With Bishop DiMarzio’s blessing, Father Perry went to local parishes on a fundraising mission, hoping to save a piece of the true meaning of Christmas in an ever-more secular world. That is when Bishop DiMarzio put Msgr. Kieran Harrington, diocesan vicar for communications, on the case. Msgr. Harrington, in turn, asked Craig Tubiolo, director of production at DeSales Media, to look into it. 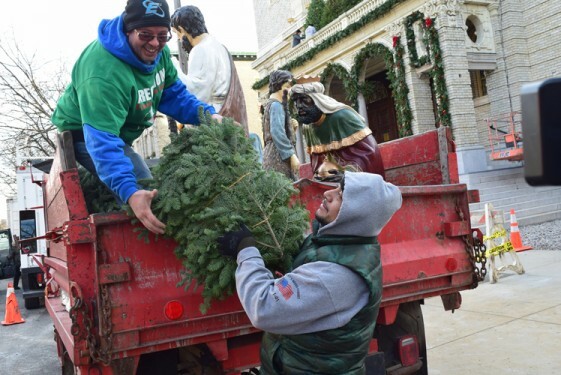 “Not only are we going to get you a tree, we are going to put up a manger,” Father Perry recalls Tubiolo telling him. Father Perry had his doubts, with city regulations on separation of church and state and all. Yet, Tubiolo kept his word. DeSales worked with the Prospect Park Alliance, Police Department and other city agencies to gain all the proper permissions and even some assistance. 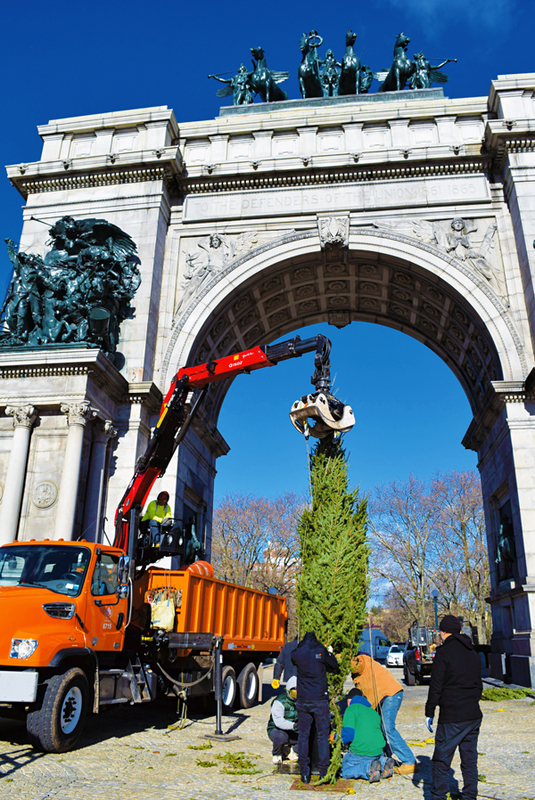 Brooklyn bid 2015 goodbye with a large tree and manger at Grand Army Plaza. When Bishop DiMarzio officiated at the lighting ceremony that year he did so accompanied by choirs of school children and local religious leaders, including from the Islamic and Jewish faiths, who came to pray for peace. Father Perry credits Sister Mary Ann Ambrose, C.S.J. with getting the community to come out and support the effort. As the tree and manger were installed, awaiting the official lighting ceremony, Tubiolo was excited that the project was expanding. This year, the manger figures are life-sized, twice as big as last year. Precision Construction Company once again volunteered its services to set up the manger. 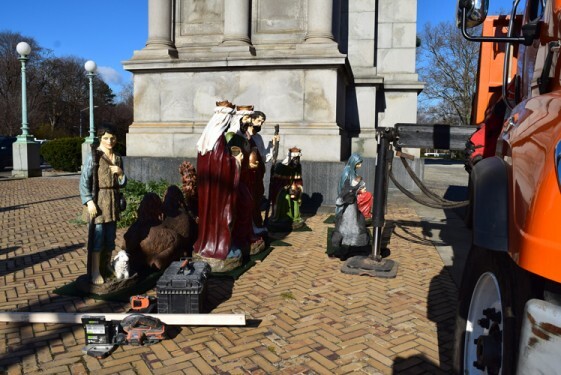 Workers from the company brought the eight pieces that make up the scene and installed them at Grand Army Plaza. 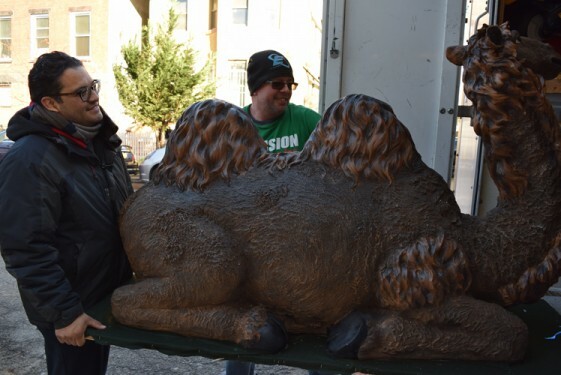 A parishioner of St. Athanasius, Sean Tubiolo said, the effort is a worthwhile cause because it puts the Catholic community in the general public’s view. “It’s the work of a bunch of people who said we want to keep Christ in Christmas,” Father Perry said. 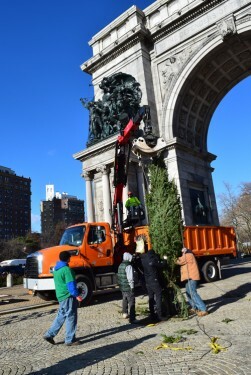 He said he is proud of how far the Grand Army Plaza tree lighting has come. 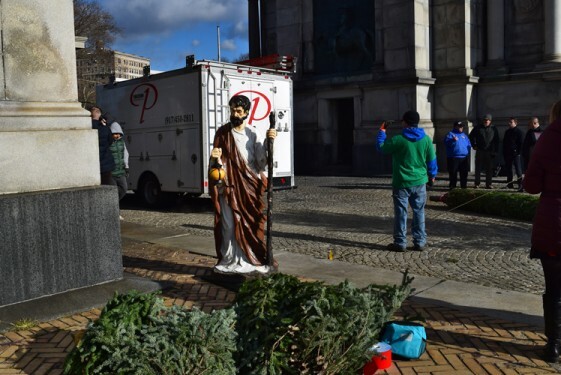 He said it is a testament of what happens when people take a moment to do more than just complain about the secularization of Christmas.